The superNODE brings landscape up and into the building, intersecting with the extension of the urban environment. The superNODE exists as a positive cultural icon, safe haven, and a playground to stimulate cultural vitality in post-Katrina New Orleans. This media-tech acts as a node of culture in the city, harboring communication and exchange through media and public assembly. 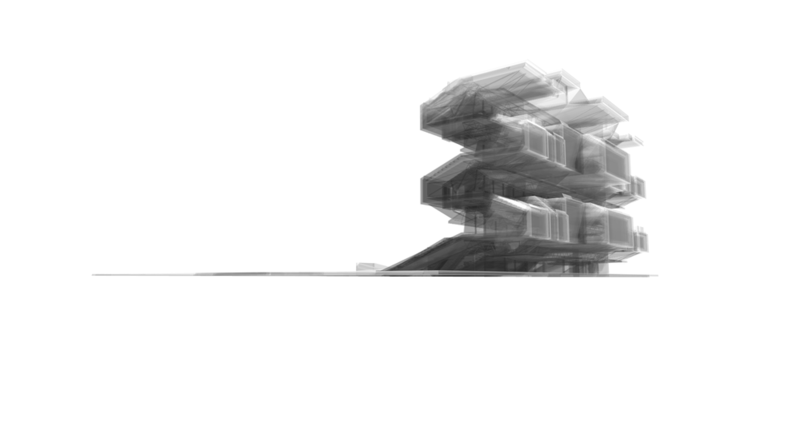 The string of the project warps and deforms as a reaction to the program of the building. This allows it to perform in a multi-scalar way, creating opportunities for concerts and rallies with thousands of people, performances in the auditorium for hundreds, and smaller gatherings in lecture halls, classrooms, and private reading spaces for information exchanges at every scale. Three urban conditions are established in the site and within the building: the public plaza, public park, and sidewalk. The plaza as an open space for gathering is established at the west side, continuing into the building’s interior. The public park continues up and into the building on the east side creating a continuous flow with the context and smaller scale elevated terracing. The sidewalk condition is created on the mezzanine levels as an overflow space of the programs on the main floors and as a consistent connector for the shifting strings. Program is defined in two axes, vertically through cultural character (perform, project, converge, commerce, and exchange) and horizontally through the action within (observe, catalog, assemble, create/workshop, individualize). The two sides of the string enhance the separation of program and multi-scalar functionality of the building by creating alternating pockets of space and distinguishing between the two orientations of the building.